Great! What does that mean, exactly? Just as we thought, Star Wars: The Force Awakens has indeed shattered all sorts of box office records. Considering the dark, yawning abyss of the prequel trilogy (easily the greatest cinematic disappointment of folks my age), I went into this movie with neutral to low expectations. Fortunately, I had avoided spoilers with ninja-like online reflexes. J.J. Abrams is normally very good at what he does, but Star Trek: Into Darkness didn’t work for me on many levels, so it was with a fortified and guarded heart that I entered the move theatre. First Impressions: I took the movie trailers with a grain of salt. Phantom Menace’s trailer is still one of the best of all time, and we saw how that movie turned out. But, Disney is distancing itself from the prequels as well as tapping into the vast well of nostalgia that folks of my generation have for the original trilogy. THE ACTING! Daisy Ridley, John Boyega, and Oscar Isaac. I really can’t say enough good things about the new folks. Absolutely amazing. Harrison Ford is one of my favorite actors of all time, and his return to Han Solo is some of the best acting I’ve seen from him in years. The fan service. I won’t lie, I enjoyed seeing throwbacks from the original. Seeing Han walk into the cockpit of the Millennium Falcon. Seeing him with Leia again. All those things really struck my nostalgia vein, even if I felt like they took it a bit far at times (see below). The cinematography is gorgeous. They really used a good mix of practical and digital effects to push the story forward without it feeling like just a CGI beauty contest with no substance underneath. The moment when Rey calls the lightsaber to her to face Kylo Ren. When she ignites it for the first time…this is perhaps the most powerful scene in the movie, and that’s saying something. Wow. Again, Daisy Ridley. Totally sold. Chewy’s rage. When a Wookie sees his best friend go down, fear for your freakin’ life. I just wish there had been more of it. Also, Leia feeling Han’s death through the Force. It was as though a billion fanboy voices cried out at the death of a fan favorite. The emotion. After suffering through Manikin Skywalker, it is SO refreshing to see fear, happiness, pain, and sadness on the faces of our heroes. It brings it all home. Fine, just don’t take off the mask. The similarities to Episode IV. It’s been said before, so I’ll keep this one brief. If the movie has a major flaw, it’s that it takes perhaps too many cues from the original trilogy, right down to bringing in the Death Star by another name. My hope is that Episode VIII can do something else that doesn’t feel like a remake of what has gone before. Lightsaber usage. They are one of the coolest weapons ever, but they are super impractical if you don’t have training. You are more likely to lop off your own leg than do anything to an enemy. Both Finn and Rey use lightsabers without any sort of training and actually do pretty well for themselves. Rey even bests Kylo Ren (who himself was trained by Luke). That was a bit hard to swallow. Luke didn’t have a lightsaber duel with anyone until the end of Empire, and that was at least after his training with Yoda. The score. When I think of incredible movie scores, John Williams springs immediately to mind. Even through the wasteland of Phantom Menace, we at least got Duel of the Fates, one of the coolest pieces of movie music ever. Here, the score was just sort of ‘there’ and the moments where it really shines are really just rehashes of previous leitmotifs. It’s serviceable enough, but not really memorable. That’s disappointing. Captain Phasma. She was billed as kind of a new kind of Boba Fett, and it’s Gwendoline Christie for crying out loud! She’s barely in it, and gets coerced into dropping the shields pretty easily. Why was she not the one that Finn fought with the lightsaber instead of random Stormtrooper #34, I’ll never know. Let’s hope she’s still alive because she had better play a bigger role in the next installment. Kylo Ren. I appreciate that he’s not a mustache twirling villain, but I think Adam Driver was a complete miscast for this part. He is an able actor, but when he took his mask off for the first time, I thought “Wait, did they get Marilyn Manson to play this guy?” He’s whiny, he’s petulant, emo, and ignores the call of the light side of the Force for reasons we haven’t found out yet. Aside from looking completely badass with his mask on (which he certainly does), he doesn’t seem like he’s very good at being a bad guy. The only reason he gets Han is because he sucker punches him. Functionally, as the villain of the story, he’s pretty weak. With the heroes being miraculously good at what they do, he’s really out of his league. General Hux. This guy is the most experienced commander the First Order has at its disposal? Despite being young and unimpressive, he is the direct analogue to Grand Moff Tarkin, played by the legendary Peter Cushing. He falls far short of anything approaching Tarkin’s screen presence or gravitas. Again, a complete miscast. Han’s Death. It was a powerful moment to be sure, but one that was painfully telegraphed ahead of time. And THEN there is no real moment of mourning or ceremony to mark the passing of a legend. I understand the emotion surrounding it all, but that seemed like a lackluster end for a fan favorite. In a movie that doesn’t seem to take a whole lot of risks, and one that is all about fan service, killing off Han Solo seems like it is necessary only because Obi-Wan died in Episode IV. More than I can count, I have. Where to start? The movie leaves so many things unexplained. If I numbered them out, this blog post could wallpaper the Starkiller Base, so here’s just the highlight reel. Who left Rey on Jakku, and why? Is Rey Luke Skywalker’s daughter? If so, who is her mother? Or is she the twin to Ben Solo? Why did Ben turn to the dark side? Did no one (Luke, I’m looking at you) ever tell Ben that Anakin turned from the dark side before he died? Who is Supreme Leader Snoke? (The horrible Star Wars name generator strikes again!) How does Finn fit into all of this? Why did Han go to see Maz when BB-8 knew where the Resistance base was? Why was the Hosnian system so important that destroying it could ‘destroy the Republic,’ a polity which presumably consists of thousands of systems? How could the First Order, a shadow of the old Empire, build something as massive as Starkiller Base without anyone noticing? Why had they not used the super weapon before this time if it was already loaded? Why don’t they just drain a system’s sun and leave the planets to die in the cold? The list goes on and on. Let’s hope that Mr. Abrams doesn’t repeat the mistake with Lost and actually explains to us what’s going on. The character of Rey is pretty divisive, it seems. Is she a Mary Sue? Is she OP? Is the whole debate over her inherently gender-biased? Would we even have this discussion if the character were male? Here are my thoughts: Yes, she does seem to be good at everything. She’s a good pilot, hand-to-hand fighter, mechanic, climber, pistol shot, etc. She picks up Force powers with no training, and she bests Kylo Ren when she has never wielded a lightsaber before. It does seem a bit unbelievable, but it is a movie called ‘The Force Awakens,’ and Rey is obviously more steeped in the Force than anyone else around her. Isn’t that enough for us to suspend our disbelief? But there’s something else going on here that I think is important. Star Wars isn’t really science fiction. Sure, it has starships and lasers and Wookies, but at its core, Star Wars is really a fantasy tale. A straight-up Joseph Campbell Monomyth. So, I think the character should be judged by fantasy standards. If we take Rey and plop her down into Middle-Earth or Krynn, do any of the arguments against her have validity? Do we really question that Eowyn is able to take down the Witch-King of Morgul? What about Tauriel? We buy that she is excellent at everything (except perhaps picking a significant other) and practically indestructible just because she’s an elf. Why is Rey any different? Here we have a cool female protagonist that’s interesting, heroic, brave, athletic, and one that is not portrayed in a exploitative or sexualized manner. We have been waiting for a character like Rey to come along. And if there’s going to be someone like her in popular fandom, Star Wars is the natural place for her to live. Oh, so THAT’s why Luke isn’t on the movie poster. It always does my heart good to see good work rewarded. The last few years have made me a bit cynical on this point, particularly due to Michael Bay’s hatchet job on the Transformers franchise. Star Wars: The Force Awakens is a good movie, and I wish it well. It is far from a perfect movie, however, and its flaws led me to merely like it a whole bunch rather than love it like the first Avengers. Still, it is wholly worth the price of admission. I plan to see to see it at least one more time before it leaves the theatres. But walking out of the movie theatre twice, with all the feels I’ve carried with me, has made me wish that the name “A New Hope” hadn’t already been taken. And that’s how this fanboy sees it. This one has been stewing in my head since December. I took a stab at writing a review of TBOTFA back in January, but it was far too long. Here is the boiled-down version of that review in convenient Fanboy Movie Review format! First Impressions: While many didn’t like the first Hobbit movie, I did. Many thought the second Hobbit movie was far better, but I didn’t. (What was up with that gold statue anyway? And that barrel sequence?) This movie strikes me as being needlessly overcomplicated in almost every aspect. It embodies the ‘bloat’ effect of this trilogy. Thranduil. We get a sense of how powerful he is. This is what it looks like when the Elven King goes to war. Thorin cured himself of the Dragon Greed, and made an epic comeback. Speaking of the Dragon Greed, the cool way Thorin’s voice started to sound like a dragon. War Rams! I’m not sure where they came from, exactly, or where they went afterwards, but sign me up! The White Council laying the smackdown on the Nazghul. While Galadriel was inert for most of the scene, I must admit that her banishment of Sauron was pretty cool. Speaking of Smaug, this is why you fear fire dragons. That first strafing pass over Laketown was terrifying. I am fire…I am death. 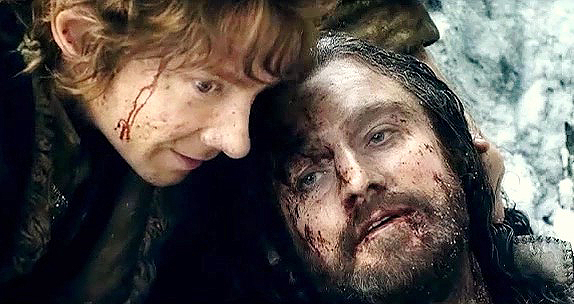 Thorin’s death scene. Armitage and Freeman nail every point of this scene. To me this scene is every bit as powerful as Boromir’s death in Fellowship of the Ring. Wow. This scene is everything the rest of the movie wasn’t. The human ‘army’ is the smallest and least impressive of the five armies, yet only a handful can somehow hold off scores of rampaging orcs in plate mail. The Elven army sort of disappears at times. It seemed like there are thousands of them lining the battlements of Dale, but during the battle it feels like they just vanish. Both the Elven and Dwarven armies are so uniform in appearance that they look like a video game. There is nothing remotely believable about them. We trade out main characters in this movie. Most of the original 13 dwarves are barely seen and have almost no screen time. Bard and Legolas have a much greater part than even Bilbo, after whom the movie is named. Legolas jumping along falling blocks of stone. I started laughing. 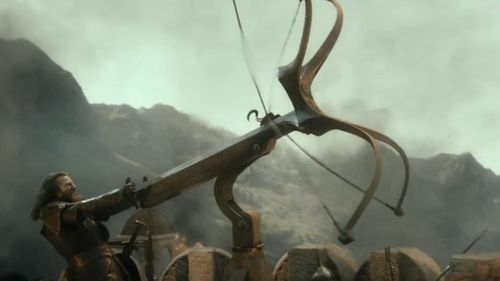 Bard kills Smaug with an improvised, cobbled together bow, instead of the Wind Lance, which they had previously showed us. And how is his son not dead again? Stephen Fry’s mayor character? Yep, as superfluous as I thought. ALFRED! The entire character is useless, annoying, and gets away with no consequences to his actions. Fili and Kili and their punk deaths. They deserved better than that. That weird kite thing that Azog uses to direct his troops. Did no one see him setting that up? If the orcs had pressed their attack, they would have won. Sending troops into Dale was completely unnecessary. The arrival of the giant eagles was underwhelming, and the force of orcs they stop seems miniscule compared to that first establishing shot of Azog’s main army. Azog busting out of the ice. Let me say that again: AZOG BUSTING OUT OF THE ICE. Tauriel doesn’t get to take down Bolg. In fact, she doesn’t get to do much of anything in this film. Thorin’s cousin, Dain. What a cartoon character, and not in a good way. So Bard can MacGyver up a weapon that can match the power and precision of this siege engine? Sounds legit. Too many to list in a simple blog post. Most of them have nothing to do with the plot of the movie, and more to do with the decisions that led them down this path. This is the same team that gave us the original LOTR trilogy, which I love. The unresolved question in my mind is simply: Oh, Peter Jackson, what happened? 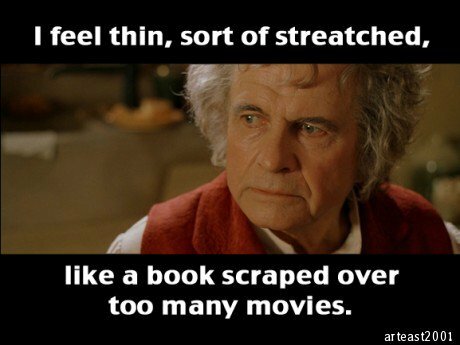 Oh, Bilbo, you deserved so much better. I went back and watched the original LOTR trilogy. More than a decade on, and they are still excellent. I still don’t care for the parts like Legolas and the Oliphant, but the emotion is there, same as it ever was. Sure, Gollum doesn’t look as polished as he did in the first Hobbit movie, but Lurtz, captain of the Uruk-Hai, is still terrifying. Why? Because it is a man in make-up, not a CGI construct. The effects in the new Hobbit trilogy looked bad in the theatre, so just think of how dated they will seem as time passes. As I said, TBOTFA embodies how bloated and overdone the Hobbit trilogy is. Most of it felt unnecessary and gratuitous, with none of the deep emotional resonance of LOTR. I tried to like this movie, I really did. While there are gems seeded throughout the film, you have to suffer through endless digital armies clashing over and over again to get to them. 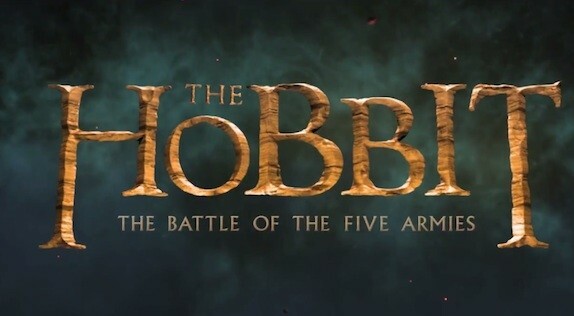 Are we fortunate or unfortunate that TBOTFA will likely be the last movie set in Middle-Earth? I’m still trying to work my way through that one. In the end, it feels as though this movie is a Master’s thesis in missed opportunities. We end the trilogy not with a bang, but a Star Wars-esque whimper.